United Airlines parent United Continental Holdings (UAL) reported a 20.2% dip in earnings for the fourth quarter due to higher operating expenses. However, the results exceeded analysts’ expectations. The company also issued adjusted earnings guidance for full-year 2019. Net income dropped 20.2% to $462 million and earnings declined 14.1% to $1.70 per share. Non-GAAP earnings soared 67.4% to $2.41 per share. Revenue grew by 11% to $10.5 billion. 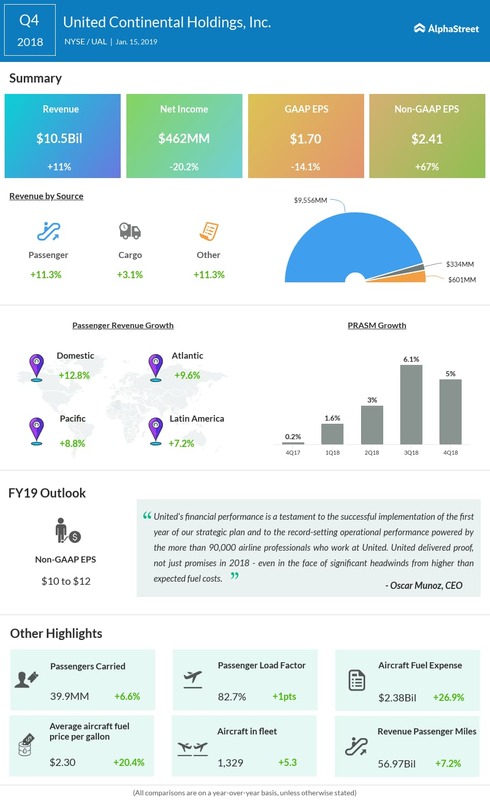 Looking ahead into the full year 2019, the company expects adjusted earnings to grow year-over-year to the range of $10 to $12 per share. Adjusted capital expenditures are anticipated to be about $4.7 billion and consolidated capacity growth is predicted to be 4% to 6%. For the first quarter of 2019, United Airlines didn’t provide any earnings guidance. It expects revenues to increase 0% to 3%, while the capacity addition to come between 5% and 6%. The company expects fuel consumption to be in the range of 965 million to 985 million gallons in the first quarter. For the fourth quarter, the company recaptured 98% of its year-over-year fuel expense increase. Load factor improved to 82.7% from 81.7% reported last year. Unit revenues, a key metric tracked by analysts, rose 5% over the prior year, while cost per available seat mile (CASM) grew 7% in the quarter due to the surge in fuel costs. Experts believe that the prolonged shutdown could do serious damage to the airlines’ industry after the remarkable turnaround in recent years. The aviation industry has urged President Donald Trump and lawmakers to quickly reopen the government. They believe the shutdown could potentially prevent summer air travel and slow the airline sector’s growth. Shares of the United Airlines parent ended Tuesday’s regular session up 1.61% at $81.20 on the Nasdaq. Following the earnings release, the stock inched higher by over 5% in the after-market session.